Mini-Traveler scooter: light weight, foldable scooter, great for traveling, malls, disney and more!Only 52 lbs. total weight! The Mini Traveler Sporty has a total weight of only 68 lbs.!!!!! The removable battery pack make this one of the most transportable scooters on the market today! Price include batteries, charger and free shipping within the continental U.S. For more info or to place an order, call us toll free 1-800-449-8991. 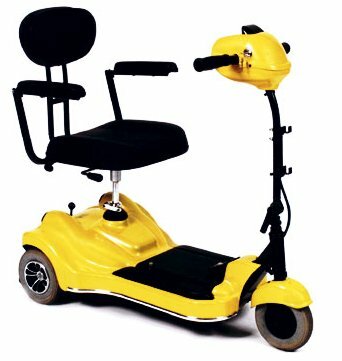 The perfect scooter for the person on the go with a swivel seat, new removable battery pack and a sporty new body style!! This scooter is truly one of a kind. It is light weight and foldable making it the perfect scooter to transport in your vehicle trunk or back seat with no need for an electric lift. Despite its compact size, the Mini Traveler Sporty is a rear wheel drive scooter and has a 250 lb. weight capacity and weighs only 89 lbs. with batteries. 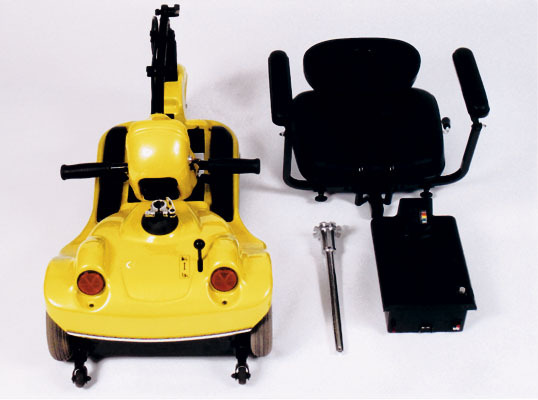 New sporty body style, swivel seat and removable battery pack! The Mini Traveler Sporty weighs only 89 lbs. including the seat and batteries. Once folded, and the battery pack removed the Mini Traveler Sporty is easy to lift and store in the trunk of your car or other small spaces, with the heaviest piece weighing only 47 lbs. The batteries are sealed and approved for airline flight, cruise ships and trains. The Mini Traveler also has a convenient handle above the front tire. 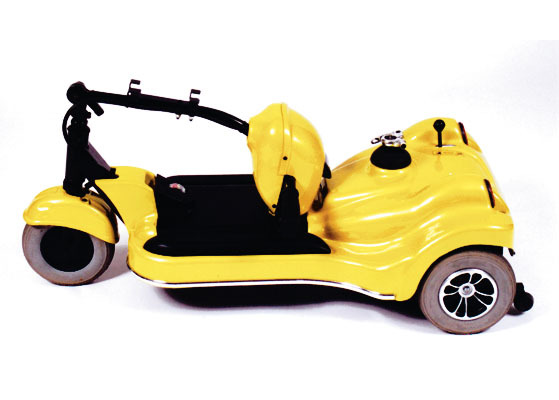 Once the scooter is folded, you can simply lift it by the handle and roll it along on the rear wheels, much like carry-on luggage that is available today. Larger seat style with flip up arm rests.